I've mentioned this before; when we travelled SE Asia for six months we had backpacks, but we weren't backpacking as such. What do I mean by that? Well, we needed to travel light as we planned on moving around a lot, but at the same time we saved enough money to be able to afford decent accommodation. Basically, we didn't stay in hostels. Well, we did stay in the odd budget backpacker haunt, but mostly we were able to stay in nice mid-range hotels... and the odd luxury splurge here and there! Touring the well-trodden backpacker route meant we were often travelling with slightly younger backpackers - it always felt nice checking in to a decent hotel for the night when we heard some of the horror stories of budget beds. Let's just say that I'm in the last year of my twenties and a bit of comfort goes a long way. Our time travelling definitely made me realise I am not cut out for slumming it - yes, I'm a princess - and those nights with no air-con and waking up to a cold shower were not for me. On average we were looking at spending around £30 a night, between the two of us. At the start of the trip we often went a little over this... and then by the end of the six months it was no surprise that we had to rein it in and were spending closer to £20 a night (and often less). Most of our accommodation was booked online before arriving at each destination to avoid trawling the streets with our backpacks in 30+ degree heat - I've done it on previous trips and it causes so much unnecessary stress! We also found we got some really great deals online - of course this wasn't always the case and sometimes you'll get a better price as a 'walk in', but we maximised the daily and weekly online sales to get good prices. So what makes a good hotel? What did we look out for when booking accommodation? When looking online the first thing we found, for most places anyway, was the sheer quantity of hotels within our price-range. So we had to start being selective... just to reduce the time spent online and maximise the time spent actually enjoying each destination. And this was fairly easy to find for an affordable price. The difference came when we were trying to find the little extras that make the stay that bit extra special. Some of the hotels we stayed in were really fancy - for backpackers at least! We knew when we were in these places as we felt like impostors with our big backpacks on and wearing our scrotty old trainers. It made falling in that big, comfortable bed all the more satisfying. You could differentiate the good hotels from the mediocre quite easily; by entering the bathroom. Soft, fluffy towels. Korres toiletries. Intricate basins and fancy tiling. Showers so powerful you question if North Thailand really was going through a severe drought. Bathtubs. In these bathrooms getting ready was a joy - no fraught shower experiences here! When it's over thirty degrees outside and eighty percent humidity, a pool becomes a necessity - not a luxury. And most mid-range hotels (that we stayed in) had a pool. Some better than others... to say the least! Infinity pools, sea views, swim up bars, swim up rooms... the list goes on. A good pool goes a long way when it's sweltering and you don't want to spend all your days holed up inside sat directly under the air-con. Although this is an option... one which we opted for on more than one occasion. Hanoi, I'm looking at you. We met lots of travellers who saw pool days as cheating. This idea that you have to spend every minute of every day exploring, seeing new things, adventuring and making the most of every second is bonkers. Yes, you may be on the other side of the world but it doesn't mean you can't have down time. We knew once the six months was out we'd be going back to work and back to the stresses of everyday life - this trip was a chance to really unwind and slow our pace. Grab a good book, the complementary pool towel (another tick off the list) and make yourself comfortable. Ideally on one of the cushioned sun loungers scattered round the edge of the perfectly temperature-adjusted pool. Where there are no children screaming. One of the best places we stayed in had a no children in the pool policy - a right pain for the families holidaying there I'm sure, but an absolute joy for us! Always a big one for me. Be it a particularly impressive breakfast menu, night-long room service, free mid-afternoon snacks or iced coffees on demand, these can transform a break from plain to perfect. A two course breakfast in Thailand meant we could have eggs benedict to start followed by cappuccino french toast with mango to follow. One fantastic breakfast buffet allowed us to have freshly baked chocolate bread and wholemeal waffles with berries... and then a plate of cheese and cured meats for good measure. 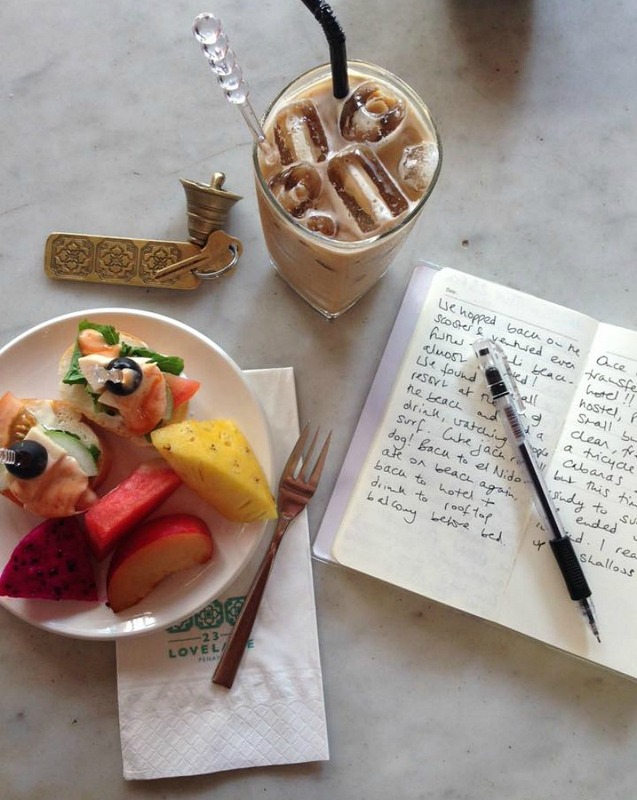 One memorable foodie moment was in Penang, Malaysia, when I was presented with an iced coffee and plate of canapes one afternoon as a complementary mid-afternoon snack whilst writing my diary. This was repeated for the following three days with a different selection of nibbles each time. Needless to say I was in bliss! And of course it's the little things that make a special stay. It could be something simple like bathrobes made in local fabrics, available to buy and take home as a practical memento. Candles lit in the evening as part of a turn down service; coming back to a perfectly cosy room, smelling delicious and looking inviting is something special. Fresh frangipani blooms picked from the garden. An in house pooch to pet and snuggle at your whim. Collection M now make it possible to bring these small touches to your own home; after collaborating with a host of different artists they now give you the opportunity to buy bedding, art and ornaments, helping you to create that holiday hotel style back home. * This is a collaborative post with Collection M. All views, words and pictures my own. All of those hotels look utterly divine! I'm amazed you got them for £30 a night; that would be impossible in the UK! I did the same 'backpacker' experience as you, that is, I had a backpack but I also had damn nice hotels most of the time. Travelling alone most of the time meant I felt safer that way and although I did brave hostels, it was through tour companies so I limited horror stories!